This was originally written as a letter to friends. Here it is 3 years later as a webpage. I'm in Sydney staying with Chris, an old friend who I hiked with when I was in Uni. With everyone else working during the week, I hike solo, so there's only one photo of me, which will be a relief to most of you. 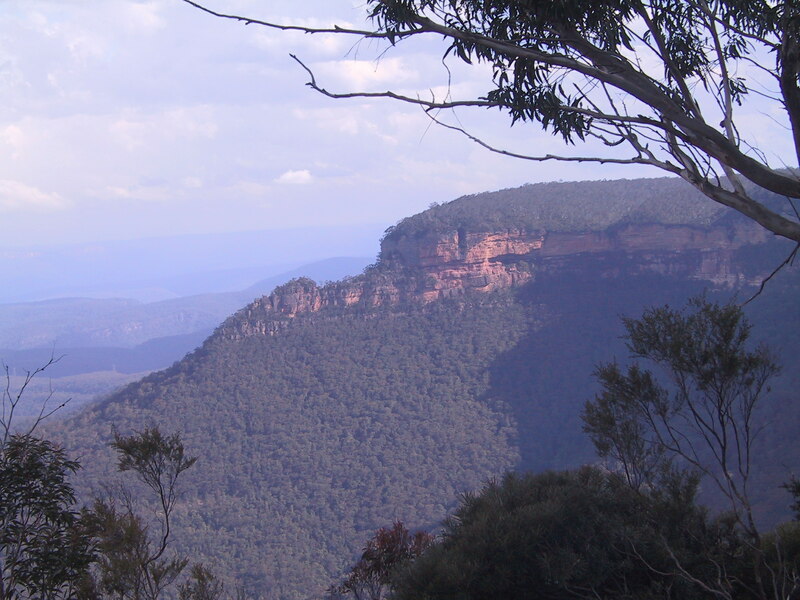 The Blue Mts west of Sydney, are an eroded plateau (and not mountains at all, despite the name), with 6 layers of horizontal, cliff forming, sandstone. Not all layers are visible at any particular site. At best you can see 4 layers at a time. The bottom two layers are Permian conglomerate, while the top four layers are Triassic sandstone. ascending the slope similar to the one seen in the left part of the photo. Depending where you are, the slope is Devonian quartzite, with a dip of about 45%deg; or (homogeneous) Carboniferous granite. The quartzite is sharp and harder on your feet, while the granite is rounded and easier to walk on. going through the sandstone cliffline. This is the bit we all like. It's challenging and you get clear views of the surrounding countryside as you pass through. The difficulty of negotiating the cliffline varies from easy scrambling to olympic level rock climbing. You pick a hike to your level. The sandstone cliffs can be sheer to broken and the patterns in the sedimentary rocks often are beautiful. walking across the top of the plateau. Once you're back from the cliffline, you're in trees and can't see a thing. descending the cliffine on the other side, and then then slope and then reaching water for the next night. 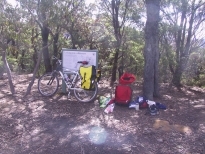 On a hike to Mt Solitary, I camped dry on the top of the cliff edge. 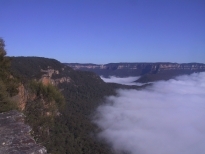 In the cooler parts of the year, in the morning, the valleys of the Blue Mts are filled with mist (and if you camp in the valleys, you wake up soaked). 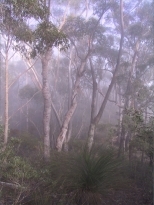 When I awoke, the mist was almost to the top of the cliffs. 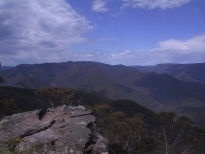 The Koorowall knife edge (ridge going left to middle next photo) I reached in about 2hrs. By then, enough of the mist had cleared that you could start to see the valley. This photo shows what it was like to walk along the top at the cliff edge earlier in the morning. Here I've reached the cliffs on the far side of the 2nd last photo and I'm looking back to where I'd come from (I'd camped on the 1 pixel bump at photo coord 0.9,0.5). 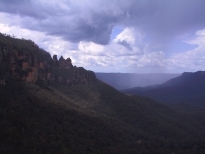 By then the valley had cleared of mist, but rain was on it's way. Just as I finished the hike, arriving in Katoomba (a convenient point in the Sydney train system) and safely sitting down to eat fish and chips, it started to hail, dropping the temperature about 10degC. A couple of days later I went on a pelagic boat trip with SOSSA . 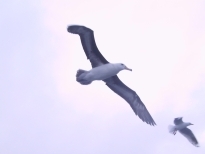 Unlike some places (eg Cape Hateras, NC USA) where you sit in a boat for 4hrs without seeing a bird, before getting to the continental shelf, off Sydney you see pelagic birds a few minutes after leaving the shore. Here the continental shelf, where the interesting wild life congregates (they like the nutrients from the deep water upwelling at the edge of the shelf) is only an hour from shore. The crew bands birds while people like me watch. Here's an albatross (sorry don't know which species, likely a Campbells from the under wing markings) with a silver gull in the background. We saw dolphins leaping out of the water, but I'm not fast enough to photograph them. In the old days, we road bashed along fire trails to start many of our walks. With the arrival of the mountain bike, we can now pedal along the fire trails, to the start of many of the walks. 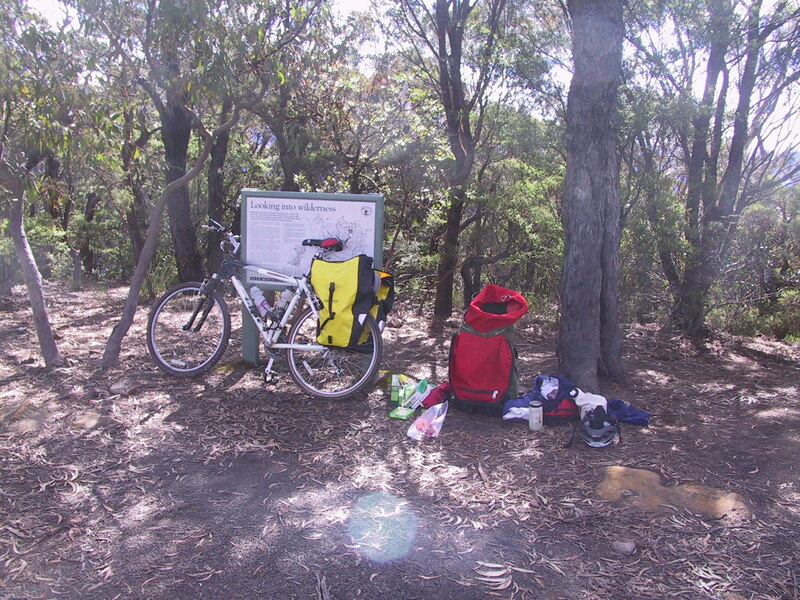 Here's the transition from paniers to pack at the end of the Narrowneck firetrail and the start of a hike in the Wild Dog mountains (known as "the Dogs"). 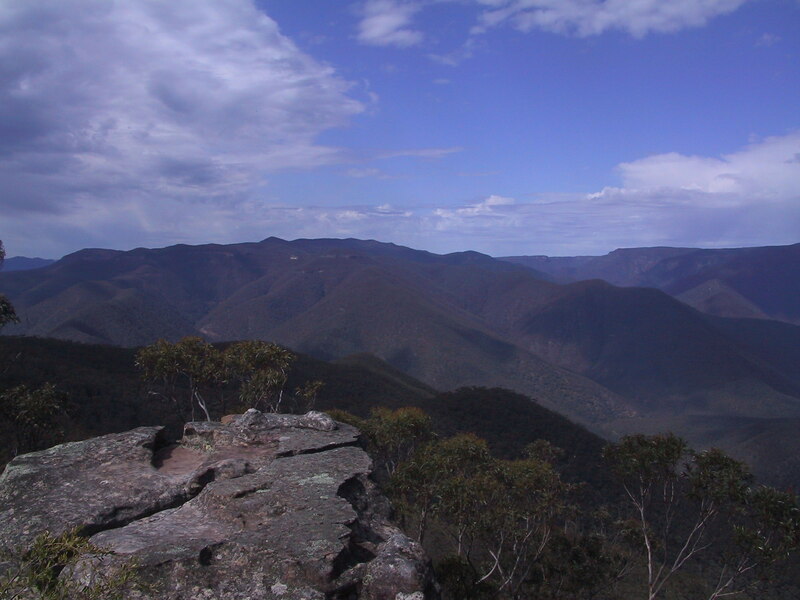 These mountains are named for the dingo, the dog the aboriginees brought with them from SE Asia. The ridges have names like Blue Dog, Yellow Dog, Brindle pup. They were all named by Miles Dunphy, the father of Australia's conservation movement. 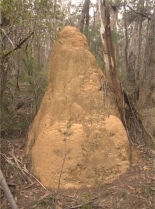 Splendour Rock is on the top of the 2nd layer of sandstone from the bottom, a layer of Permian conglomerate. You get a 300deg view of the surrounds and you can count off the spots you've been to and look at the places you've yet to visit. It's regarded as the best view in the southern Blue Mts. 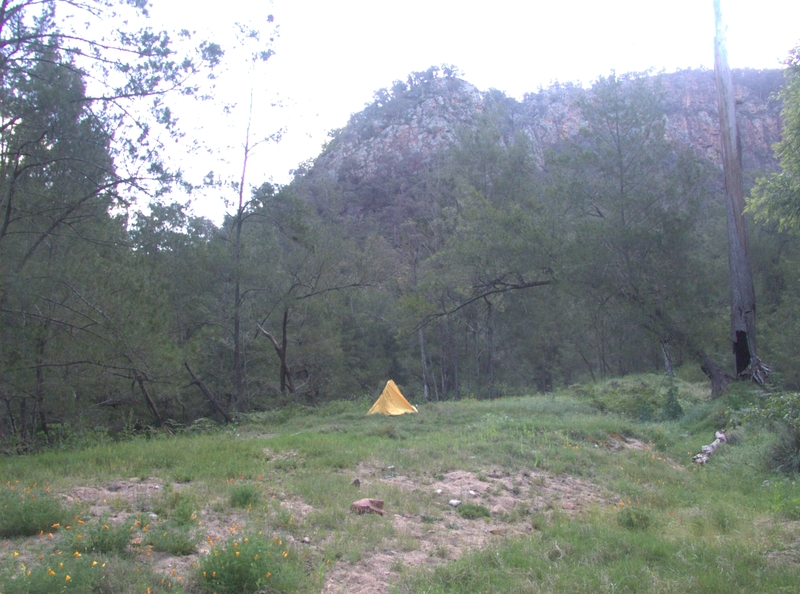 I camped below the Permian conglomerate, at a spring about 2km back from Splendour Rock. 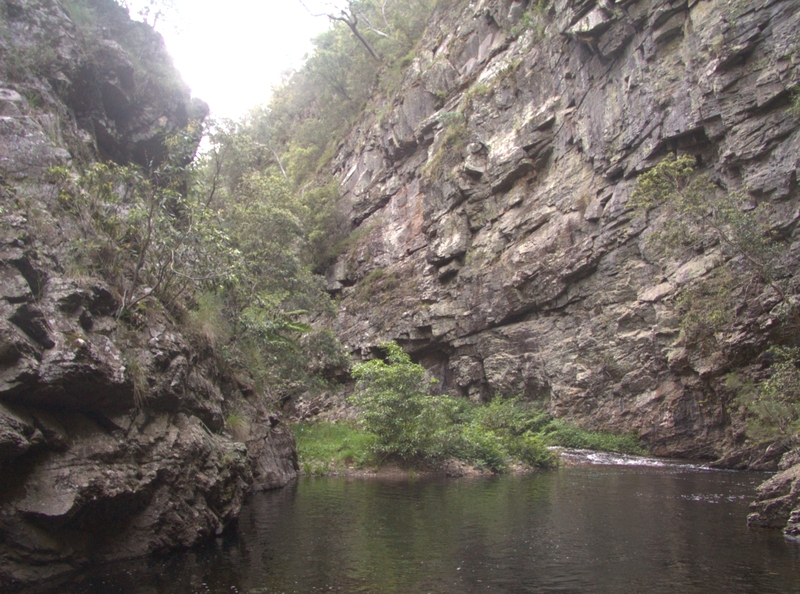 After visiting Splendour Rock, I decided to go for a swim in the river below. It was about 800m below and took about 2hrs to get there. 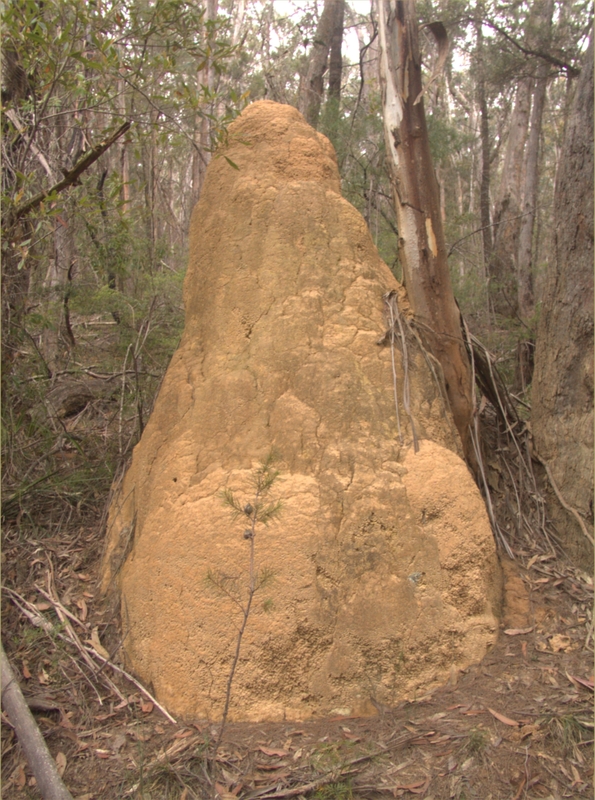 On the way I saw this termite nest (it's about 2m high). Termites are a major factor in breaking down dead trees. There's plenty of dead trees. Just walking through the bush, about once a day, you hear a loud cracking and a crash of a tree falling. Whether termites are involved in weakening the tree or only start work after it's on the ground I don't know. When picking up a dead tree for firewood, you often find the bottom side wet, rotten and riddled with holes that the termites are using as passage ways to disassemble the tree. On the way to my swim, I meet a varanid, a member of the monitor lizard family (e.g. the Komodo dragon). These are fairly common. It's official common name is the lace monitor, but no Australian knows it by that name. 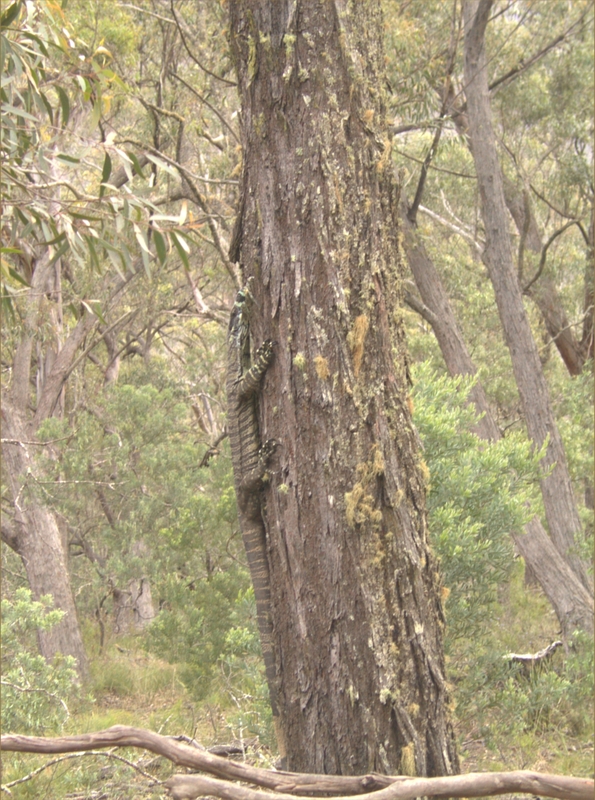 They call it a goanna, its name in one of the aboriginal languages. The aboriginees like eating them. 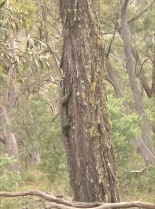 The goannas are wary of humans - the goanna and I danced around the tree, till I could see enough of him to photograph. Since reptiles grow indefinitely, old ones can be quite large. I've seen one about 2m long from shoulders to hips - it was on the ground and wasn't aware of me and was walking towards me. It looked like a small crocodile. This one is about 1m from hips to shoulders. They eat grubs in the bark. 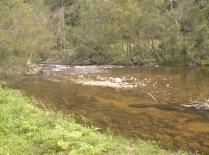 Here's my target for the afternoon - my afternoon swim - the Cox river. 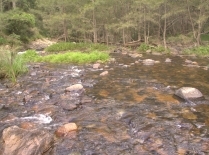 This is one of the major rivers around Sydney. That this is one of the major rivers, and Australia is currently in a La Nina (wet) period, will give you an idea of how dry Australia is. Like all of the big rivers in the Blue Mts, they're undrinkable - you have to boil the water. Anywhere that water flows past human habitation results in undrinkable water (bacteria and viruses). The Australian animals don't seem to give you any problems (e.g. giardia) and if the river's catchment doesn't include humans, the water is safe. I don't trust iodine to kill viruses, so I boil the water. 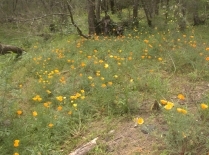 On the banks of the Cox for many miles are california poppies. Figure 11. 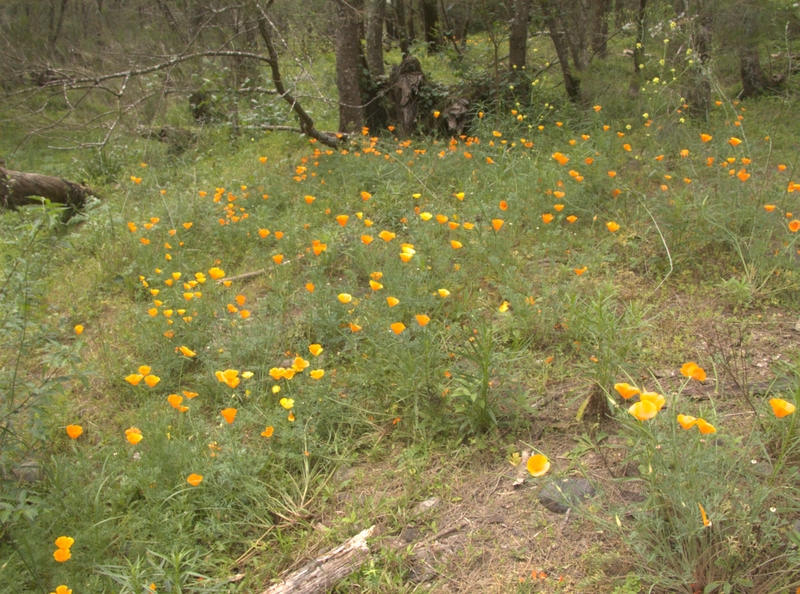 California poppies on the Coxs R.
These look nice, but they shouldn't be there and their presence is new. Someone had to deliberately seed these. It's not like they came to the Cox, hidden in cattle feed, on pallets in ships. Australia has enough problems with xenobiotics (rabbits, foxes, cane toads, patterson's curse), without people deliberately introducing more. I called up the National Parks on my return - they didn't know that california poppies had reached this far into the Blue Mts, although hundreds of people go past this spot every year. Here's my camp on the next hike (also in the same area), a couple of km upstream on the Cox from the last photo. Figure 12. Camp at Jenolan Gorge. Here I am crossing the Cox heading to the gorge. 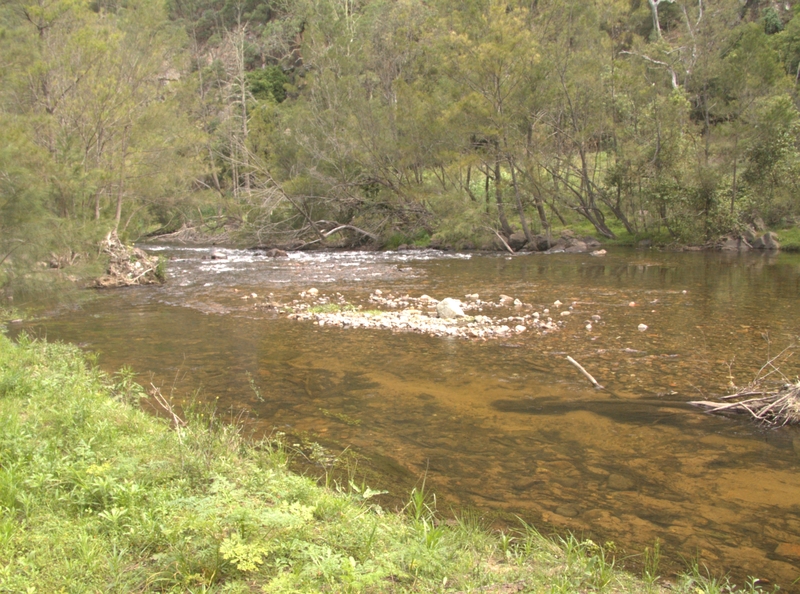 To get to the gorge, I walked upstream along the Jenolan river, a process called creek bashing. It's slow going - you're stepping on spherical rocks, underwater and hard to see against the reflection of the sky. 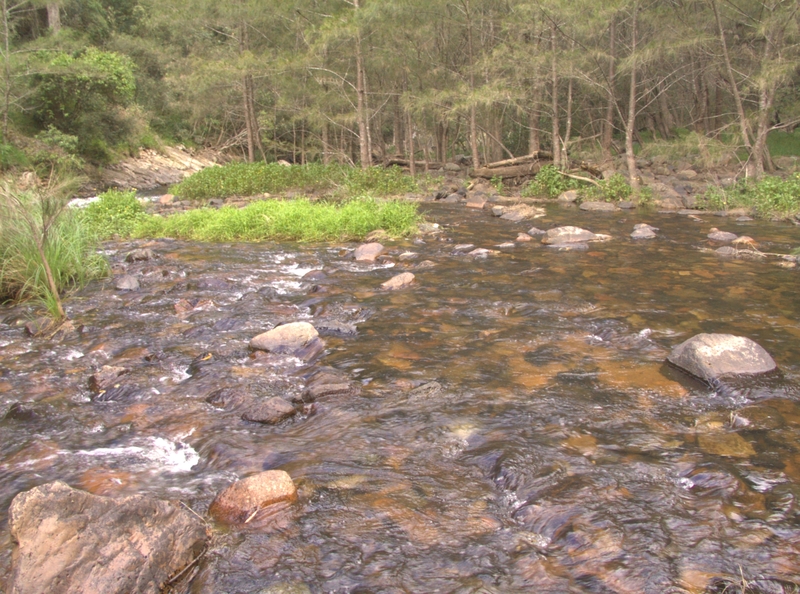 The outer side of the bend in the river is usually against a cliff, while the inner side is overgrown and has stinging nettles (another introduced pest, presumably from feed from cattle upstream). Here I am at my furthest point in the gorge. From here I would have had to swim, something I didn't want to do solo. I suspect (but don't know) that the end of the gorge is where the dipping strata on the right meet the river. The quartzite, having a dip of 45deg, doesn't form sheer, clean cliffs like the horizontal beds of sandstone - instead the cliffs are rough. 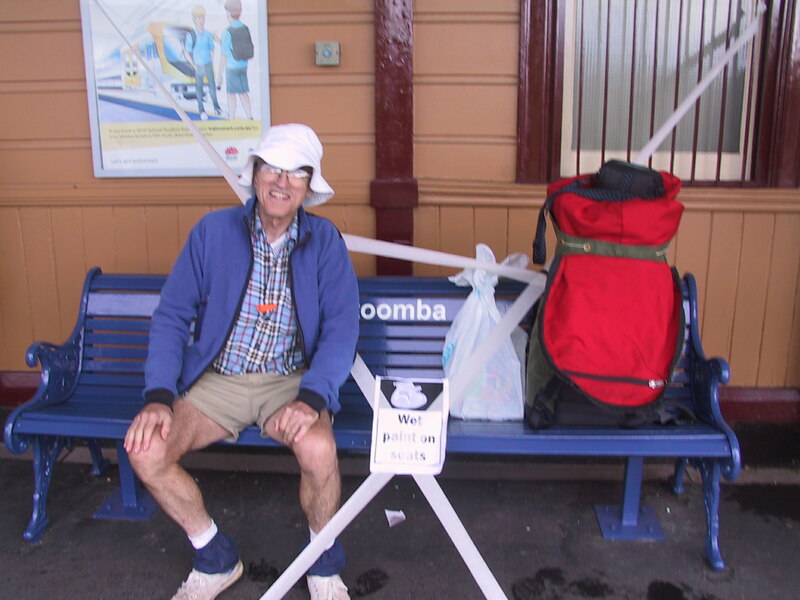 On my way out, all the seats at Katoomba station had been recently repainted. They were dry to the touch, but still had "wet paint" signs up. There were about 100 people standing around, waiting for the train, but not a person on any of the seats. 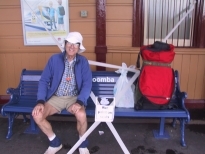 Since at remote places in the Sydney train system, like Katoomba, you can wait upto 10mins for a train, I took a seat. Everyone who walked past me looked at me, then the signs and then suddenly looked away as if they hadn't seen me. There wasn't a grin from any of them, at the incongruenty of the situation. It was like a book I liked reading to Austin when he was young, in which a snooty hotel has a mouse. The reader (and the hotel's clients) can clearly see the mouse in every drawing, but none of the staff see the mouse and tell the clients "there is no mouse". The Emporer's new clothes all over again. What's really frightening is that these people have jobs, some of them run businesses and are in charge of other people. Some of them might be running the country.